I hope your dear wife and you are in good health. For my part I am doing my best serving as a Pharmacists in this General Hospital under General George Foster Jr, once head of the Tripler General Hospital in Honolulu before the war, beside as an Pharmacists I am setting myself as one of the Japanese American, in the U.S. Army. Good news—I received an o.k. 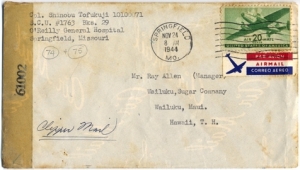 from Washington D. C. that I could return to Hawaii on a furlough for 15 days, traveling time don’t count, leaving here second week of December and be in San Francisco by the 15th and from their to Hawaii on some Army bomber, this news is too good to be true so even now I could hardly believe it, I’ll be spending my Xmas and New Year with my wife and folks. I thought since I am returning home I could possibily get a transfer to some hospital in Wailuku or near Wailuku as a Pharmacists or in a medical depot. I am under the limited service with my back trouble, even while working in the Pharmacy lab., I am getting Physio-theraphv treatment every other day since the day I came to this hospital. If I return to Hawaii and try to transfer I won’t have much time since I’ll have only 15 days, since time is too short I won’t be able to do anything so I am typing this letter ahead of time. 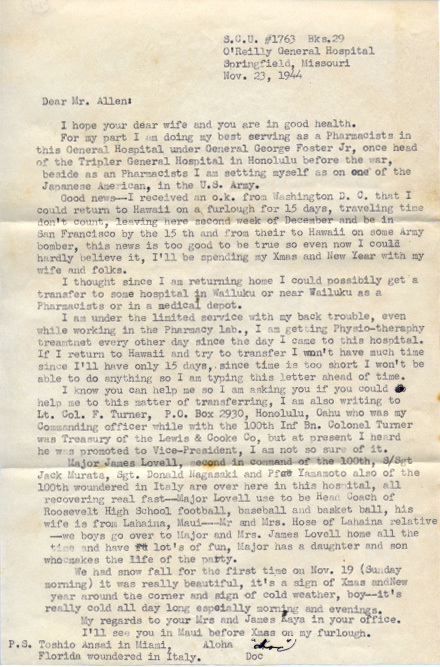 I know you can help me so I am asking you if you could help me to this matter of transferring, I am also writing to Lt. Col. F. Turner, P.O. Box 2930, Honolulu, Oahu who was my Commanding officer while with the 100th Inf Bn. Colonel Turner was Treasury of the Lewis & Cooke Co, but at present I heard he was promoted to Vice-President, I am not so sure of it. —we boys go over to Major and Mrs. James Lovell home all the time and have lot’s of fun, Major has a daughter and son who makes the life of the party. year around the corner and sign of cold weather, boy—it’s really cold all day long especially morning and evenings. My regards to your Mrs and James Kaya in your office. I’ll see you in Maui before Xmas on my furlough. P. S. Toshio Ansai in Miami Florida woundered in Italy.